I lived very near Lakeside Park in 1940-41 and frequented the park often. Went swimming in the pool there. There was a large rec hall near the pool, and a caretakers house on Peer Ave. The base for the carousel was still there. The Crystal Township Historical Society is interested in obtaining copies of any info and/or photos of the Carousel that was in Dr. Stuart's Lakeside Park in Flint. If anyone is interested in submitting info or photos please contact the CTHS organization at CTHS@CrytalHistory. com. I have a black and white picture of the 1916-17 Herschell-Spillman carousel taken while it was at Lakeside park. I would be glad to email it to you if I know the adress to email it to. Thanks Helen Decker, member of the National Carousel Assocciation. I grew up on the other side of the expressway from the former site. As kids we would go swim in the pool there in the late 70's and play basket ball at the rec center. They used to have all sorts of pics of the park there but it has since been torn down and a new community center built there. The site is now McKinley Park, on Collingwood on the west side of Thread Lake. In regard to the story of the park closing after the roller coaster fell into the lake. 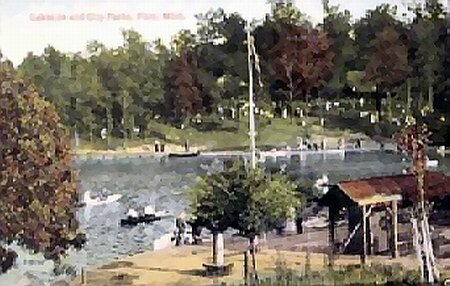 It is posted on the website for Hague Park in Jackson, Michigan that their roller coaster had fell into the lake sometime around 1924, and people had drown. In fact there is several postings by people who had dive down at that site, and found pieces from the wreckage including a part of one of it`s cars. I have also heard similiar stories about the roller coaster at Lake Lansing. I have a magazine that was publish by the National Carousel Association that is devoted entirely to the history of Lake Lansing. Nothing is mention about such an accident. It does mention however, that the pavilion for the carousel was built from the wood that was torn down from the roller coaster that was at Hague park. I think that how that rumor got started. It also mentions that their roller coaster was remodeled in 1926. Perhaps to make it more safe so they will not experience such an accident. To me it seems unlikely that all three coasters fell into the lake. They all look so rickety suppose it could of happen. If it did there should be news articles about the acidents in the Flint, and Lansing Journals. Does anyon know where the site was? Directions?. I have wondered bout this all my life. My Dad Terry Lough, born 1941 on Madison Ave , son of Percy & Kathryn Lough, grandson of Vinton & Bessie Lough, always told stories of this park. He said they closed it after the roller coaster went in the lake and I believe resulted in deaths, don't know what year though. WOW ! The photo is CHILLING ! Dad always took my brother & I here to play. This site is WONDERFUL !. I have a correspondence from 1931 between Dr. Stuart (owner of the Carousel) and Freeman Dairy of Flint apparently arranging for the ceasing of Ice Cream deliveries to Lakeside Park. Half of the letter is eaten away so it''s hard to tell. The letter is from Freeman Dairy. I can remember my Dad talking about how he worked at Lakeside Park when he was a teenager. My Grandparents lived just north of the park on the lake, so he only had to walk a couple blocks to get there. Dad passed away in 1998, so it''s only my bad memory now, but I do remember him saying something about painting Kewpee dolls that were used as prizes for playing the games. Interesting history. I am from the Crystal Michigan area and I''m looking for any info and especially photos of the Merry-Go-Round that was located in Crystal. Our photo clearly shows a roller coaster (on the right in the photo - around the outfield of the ball diamond). My family just purchased a farmhouse and outbuildings in Crystal Michigan. We had heard rumors that a doctor once owned the house and carousel. 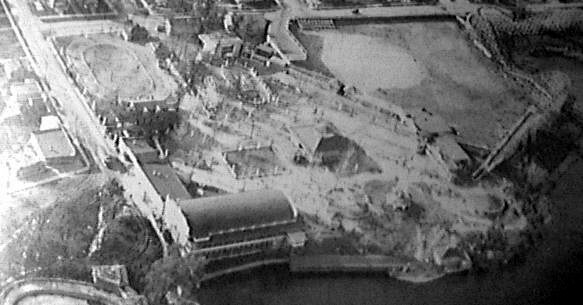 In a barn we found a number of badly deteriorated items relating to the Stuart family including brochures, postcards, tickets for the carousel at Lakeside park and an aerial photo matching the one on this site, but better detail (perhaps retouched?). We also have a few family photos. We also found a number of tickets for Heidelberg Gardens, but have no other information on what or where that is. In regard to my previous message. 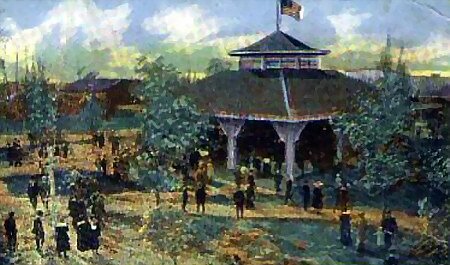 I would like to add that it is believe that the pavilion that is shown in the picture below is where the 1916 Herschell-Spillman carousel was house. I attained this information from a magazine publish by the National Carousel Association. It would be greatly appreciated if anybody has any pictures or information to share on this carousel while it was at Lakeside park. It has a Punch & Judy chariot, and a spinning lovers tub. Also has 2 roosters, 2 zebras, a dog, and a pig on it, with 30 horses. They are all jumpers. Mary Helen Burroughs, daughter of Dr. James D Stuart, the carousel`s initial owner, also help fill MSU in on alot of the information. If anybody knows any descendants of this family, they may be able to help pass on additional information, of both the carousel, and the park. In 1915 & 1916 the Genessee county fair was held at this park. Dr J D Stuart purchase a new Hershcell-Spilling carousel for the park in 1916. It remain there until the depression forced the closing of the amusement park. Dr Stuart then moved his carousel to Crystal, Michigan, where it remain until it was donated to Michigan State University in 1979. Then it was loan to Auto world, and once again it was located in Flint until Theme Park closed. Michigan State is making plans to build a room for it. I have read that there was a roller coaster at the park among its attractions. 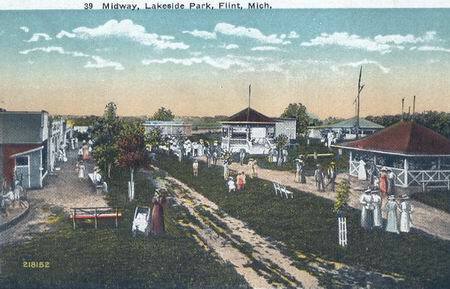 Lakeside Park was originally known as Peer''s Grove prior to the 1900''s. In 1936 the City of Flint bought the property and demolished the structures and in 1942 it was renamed McKinley Park after former Mayor George L. McKinley. (Information from Flint 1890-1960 an Arcadia Postcard history Series book) The only thing remaining is the ball diamond. The park is currently in fairly bad shape. Anyone have the information of opening and closing date of this park. May investigate the site even though its been 80 some years.